I see that the annual end-of-season rating of the drivers has begun - The Times newspaper has conducted a poll of its readers and the winner is Alonso. That should show that British fans are not nearly as chauvinist as they are accused of being at times, Hamilton only making it into second place in spite of becoming champion. Most of these annual assessments, whether by poll or personal opinion, are based on the year's performance and so they reflect mainly on each driver's fortunes without considering previous form. It is rare for a driver to be so outstanding as to overcome a year in a poor car or unusually bad luck; Alonso has obviously achieved this in The Times survey, with readers taking into account his machinery when considering him. Few others are granted such allowances and this is illustrated by Nakajima's being placed at the tail end of the field, clearly an unfair judgement when the field contains such as Piquet Jr. I find such season-based ratings to be a bit pointless since they are really guides to the known fortunes of the drivers - and the points system gives a pretty good measure of that already. It would be more interesting to attempt to assess drivers for their performance throughout their F1 careers, taking into account such things as machinery, previous results, length of service and reaction to adversity. In this system, the wild fluctuations we see so often should even out as the years continue, so that we have a more realistic idea of each driver. Hopefully, drivers who have never been given a decent car but have obvious talent (Webber, for instance) would fare better under such a rating. With this in mind, I set out to establish my own list of the best and the worst. It is not easy, apart from the first two places; so many conflicting claims and circumstances crowd in on one that it becomes necessary to separate the closest contenders by personal preference in the end. For what it is worth, however, the deed is done and some very strange results appear. You can argue with me over the most unpopular choices but I give a brief explanation for each rating. Naturally, we can agree to disagree on any of these. Last year, I rated the teams from top to bottom and posted the list in that order. That was, perhaps, a mistake in that it gives away my choices for the best straight away. This time I will list the drivers in reverse order and give you only the lower ten today. Tomorrow we can look at the happy winners in my personal rating. 20 Nelson Piquet Jr. Nelson may be a far better driver than he showed us this year, but we have to look at results in the end. Yes, he is a rookie and so we should not expect miracles, yes, he did not have the best car on the grid, yes, he improved as the year unfolded, but is that enough to excuse him for some pretty awful performances? I think Nelson should be relieved and grateful that he has been given another chance by Renault - plenty of drivers find themselves out in the cold after such a poor debut. 19 David Coulthard. A case of a season too far, I think. David has been a stalwart of previous years, providing honest although not spectacular drives for his teams, but this year he has made far too many mistakes for a driver of his experience without much to show as regards results. This was the year in which David's value as a competent development driver was finally outweighed by his mediocre race results. 18 Adrian Sutil. It is hard to shine in a car that is the weakest on the grid and Adrian did little for his cause this year. Being behind the old man, Fisichella, for most of the year in both qualifying and the race demonstrates a worrying lack of pace and racecraft. Until it rains, that is. On a wet track, Adrian is transformed, apparently one of that forgotten breed of rain specialists like Hans-Joachim Stuck. It is this that lifts him off the bottom of the list. 17 Giancarlo Fisichella. And so to the old man himself. Initially, it looked as though Fisi was going to give us one of his outstanding years in an uncompetitive car but he began to tail off towards the end of the season as though tired. Like Coulthard, he has had his chances and his best years are behind him. I suspect that 2009 will prove Fisi's season too far and we might see Liuzzi driving for Force India in the latter part of the year. 16 Kazuki Nakajima. I really wanted Kazuki to be higher on my list but from here onwards competition becomes very stiff. These midfield drivers are so evenly matched that it is extremely hard to separate them - Nakajima loses out mainly because he is so new to the game and has no track record to refer to. He made his rookie mistakes but generally was much quicker and consistent than expected, sometimes outperforming his highly-rated team mate. Next year I hope he will surprise us all again and start climbing up this list. 15 Sebastien Bourdais. Be kind to Sebastien - he is in the unhappy position of being the unwanted driver at Toro Rosso, a team that handicaps itself by playing favorites. Once Vettel had established himself as quicker to get the best from the STR3, Bourdais found himself striving to make his mark. Late season performances improved enormously, however, and the team would be insane to drop him for 2009; he has done his apprenticeship and should be a much better driver from now on. 14 Jenson Button. 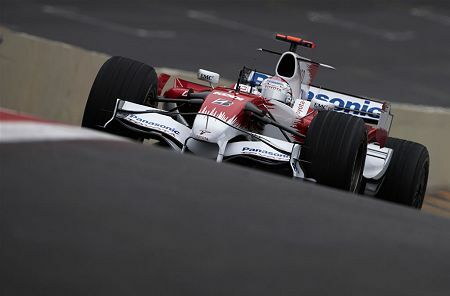 Jenson makes it this high only through his performances in previous years; 2008 was a season to forget for him, too often over-shadowed by his team mate and compounding the error by comparing himself with Hamilton. The talent is there but where is the grit and determination so evident in Alonso, for instance? Both had bad cars with which to start the year but one got stuck in and made his better - what was Jenson doing meanwhile? 13 Rubens Barrichello. Well, he says the fire is still alight and, judging by some very determined performances this year, one would have to agree with him. There were times when he dragged that Honda into positions where it really should not have been and he proved that he is at least on a par with Jenson when it comes to wet weather ability. If this should prove to be his last season, he can leave with head unbowed. 12 Jarno Trulli. I seem to have hit a rich vein of old men around here - Jarno is another who keeps providing the goods year after year, retaining his reputation as a qualifying specialist but beginning to put behind him the worries about race performance. He was not outclassed by his increasingly-rated young team mate and thoroughly deserves another season with Toyota. Expect retirement at the end of 2009, however. 11 Timo Glock. One of the coming men, Timo had an awful first half and a brilliant second half of the season. We judge him against Trulli and he has not been found wanting in the end, often faster than a team mate known to be one of the quickest over a single lap. As his racecraft improves with experience, I expect him to move up this list to become a solid all rounder, a valuable asset to any team. I believe that DC's season was by far worst than anything. I could remember of only one race when he were OK. The same goes to Sutil, but at least he is in a FI. Piquet had two or three good races. Button seemed not interested at all during the season. Fisichella outclassed Sutil consistently. Bourdais had a good start of the season, then when STR3 debuted he sunk. It took a long time for him to adapt to the new car, and then he started to deliver again. Nakajima is a rookie but commited less mistakes than expected and offered a challenge to Rosberg a number of times. Rosberg started the season well, but I expected him to be more capable of helping williams improve the car, but it was not the case, as we saw it. I believe that what sums up RB's season is "There were times when he dragged that Honda into positions where it really should not have been". What surprises me is how closely we agree on the names if not the order. Hopefully that means we're getting it approximately right. I rate Button higher than you do only because he has done well in the past - he does seem to perform better when the car is good and so might begin to shine if Honda can get it right next year. I tend to agree with your list Clive, except I'd rank Button and Sutil lower. I know Sutil is in a Force India but if he were as good as some would have us beleive, he should be punching above his weight. I am tempted to compare him to drivers such as Alonso and Webber who hauled their Minardi's into places they had no business to be in. I've not seen anything similar in Sutil, except of course when it rains. And even then, he has not exactly shone. I give him another 12 months. And I have long and oft stated that Button is the most overrated driver on the grid. Honda only keep him because he cost them so much $$$ buying out the Williams contract, and they -misguidedly- hope one day he'll prove a return on investment. Cut your losses, I say. I'd also say that by now Rosberg really should be in the top ten, and I have been disappointed by his showing so far. I know he is not in th best car either, but I'm sure another more consistent driver would be able to extract more from it than he can. Still, I am happy for him to stay in F1 - he does provide some nice eye candy for after the race ! I tend to be kinder to Rosberg than you, Peril - the car has been unpredictable this season, good at some circuits and poor at others, and I think this has disguised Nico's talent. in my book, he still gets the benefit of his good performances last season (obviously, since he must be in my top ten as he doesn't appear amongst the lower bunch). He must work hard next year to justify my faith in him, however, and part of that will be staying ahead of Nakajima. A pretty good evaluation of the ten not-best drivers this year imo, Clive. Glad to see Rosberg not in there. I'd personally have put Barrichello behind Glock and ahead of Trulli, and that's about it! Shame about Nakajima this year. I too thought he might be a diamond in the rough, but while he has improved, it's not to the level I was hoping for - especially in qualifying. Plenty of time for him to improve before next season though. Kovalainen is a driver that could have gone in there, but that is only from comparing his results to his teammates', so I'm glad he didn't slip so low in your estimation. I found Kovalainen one of the hardest to assess, Toby. He's getting a lot of criticism at the moment, mainly from those who hoped he would run Hamilton close, I think, but he has suffered all the mechanical trouble going at McLaren plus we know his luck is pretty awful even from his year with Renault. Taking it all into account, I think he belongs in the top ten. I don't think Sutil is great or anything, but getting a Force India into 4th place in a race that despite being chaotic had very few DNFs is more impressive than anything Alonso did at Minardi when his big claim was that he was often in the 9th row while the team other driver was almost always in the final row (except for Suzuka where he really had a very good race). And Webber also never truly put his Minardi in any amazing place, the only cars he was ocasionally ahead of were the rookie Toyota and bankrupt Arrows. Clive, the thing that I'd put against Rosberg (and the reason I'd have both Toyota drivers ahead of him) is that he throw quite a few races where Williams look competitive (Monaco, Montreal). I agree, Filipe, Monaco was a tremendous race for Sutil and I think everyone felt the injustice of his failure to finish through no fault of his own. But that is one race (and yet another indicator of his wet weather skills) - and I expected him to do more in later wet races. In these he was a little disappointing and I had to be hard on him for being a specialist who doesn't always shine even in his speciality. Rosberg stays in my top ten purely thanks to his excellent 2007 showing. Yes, he looked poor on occasion this year but I am prepared to give him a little leeway until he has a better car under him. He made mistakes but even the best did the same in 2008! Clive, we actually are very much in agreement. I would probably rank Sutil at 18h or 19th myself. I just don't think is very fair to claim that Alonso or Webber did that much more at Minardi (well, they beat their partners, but Sutil got Fisi while they had Tarso Marques and Alex Yoong). Pretty solid list. Honda has never been able to produce a good chassis, even going back to the 60s. Whether they don't listen to Button and Barricello or those two have nothig to offer on development is an interesting topic. I'm drawing a complete blank on his name, but the South American driver who went from Newman Haas champcars to Toyota several years ago said Toyota was very unreceptive to several suggestions he made for improving the car. That seems to be the Japanese way, leave the engineering to the engineers. Thanks Ali! You should be the F1 Wiki. Filipe, Rosberg did no less than Lewis Hamilton in Canada. And in Monaco, something broke on the car, which then catapulted him into the swimming pool barriers. He has lost his front wing too many times this season, but I wouldn't hold that against him too much, due to the closeness of the racing this year.